We met the team at Family Foot and Ankle through Top Practices. We were excited to revitalize the web presence of this growing podiatry practice and are thrilled with the final results! Their original website was very limited on content. There were not many pages on the site and it was very difficult to navigate. Patients had to hunt and peck to find the information they needed; the answers to their questions were buried deep in nested pages or fragmented across many pages. Also, there were no calls-to-action in the content, leaving users without the motivation to call and make an appointment or further engage with the podiatrist. The client was also unhappy about the way the website looked. The color scheme was dark gray with red: gloomy and forbidding. Not what you want from a podiatrist's website! We fixed this by adding in more cheery, bright colors, but kept the design grounded with darker elements, thus ensuring that the site still appeared professional. The new site is far and away more modern and clean, a vital characteristic for any physician's website! When the site was clunky, old, and outdated it gave patients the feeling that the maybe the physicians (and their medical advice) were old and outdated as well. Not good! By creating a clean, modern site, these fears vanish and users rightly assume that the doctors at the practice are clean and modern as well. What we did: Before the redesign patients had to click through page after page to get to the forms they needed. To fix this we created a large, unmistakable button. Why does it work? The patient form button is present on each page of the site, making it pretty much impossible to miss! Patients are no longer frustrated by confusing navigation, and as a bonus the practice is saving time and money. Now more patients bring their completed forms to the office, eliminating the need to wait for the patient to fill them out in office or pay for paper and ink. What we did: This practice has six office locations, but on the old website none of these had maps. So on the new site we created an office detail pages with embedded Google maps. Also, we created a prominent, interactive list of all six offices. All a patient needs to do is click on the nearest location and find not only the address and Google map directions but location details as well. Why does it work? The office location feature works because it's easy and intuitive. Patients no longer need to hunt down the locations nearest them or to find easy-to-follow directions; it's all at their fingertips. 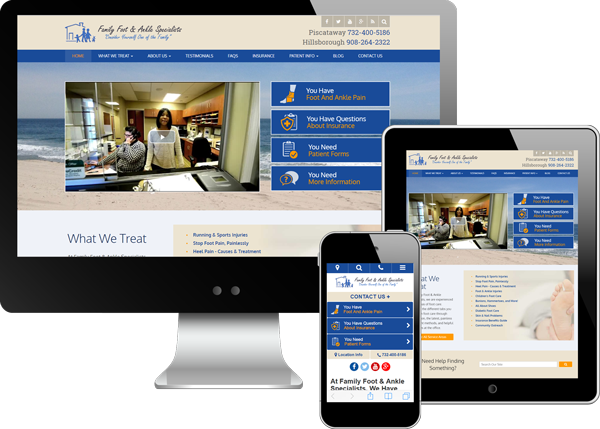 What we did: The Family Foot & Ankle Center wanted a better way to organize their content. Doctors and staff wanted to be seen as experts, and they understand how important content's role in claiming that position. However, finding this content was difficult on the former site. So we made sure their content was front and center, organizing it by practice area. Why does it work? Potential or current patients who visit the site are looking for answers to very specific questions. A well-organized library, blog, and FAQ section allow these patients to quickly and easily find what they need. In this way, the new site gives users the experience they expect: quality information with the click of the mouse.